Researchers and industry participants accelerate their work nearly up to 1000 times after a week of fast-track learning process that helps them optimise their code using GPUs. This was achieved with the support of Pawsey supercomputing experts and internationally renowned mentors during the second edition of the GPU Hackathon, jointly organise with Oak Ridge National Laboratories and NVIDIA. Graphics Processing Units (GPUs) have become a proven engine of scientific computing, enabling simultaneous calculations. A GPU hackathon is a 5-day coding event in which teams of developers port their applications to run on GPUs, or optimize their applications. While many research teams have gone all in on GPU architecture, others are starting to explore the technology at events like a GPU Hackathon. Each team consists of three or more developers who are intimately familiar with (some part of) their application, and they work alongside two mentors with GPU programming expertise. The mentors come from universities, national laboratories, supercomputing centres, government institutions, and vendors. 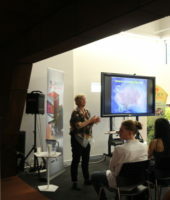 The Perth event, hosted at the CORE Innovation Hub, featured 5 teams and more than 30 participants representing academia, industry, and government. Teams include Let’s Get Physical from Curtin University, HiPSTAR EXPRESS from the University of Melbourne, Team ASKAP from the CSIRO, Multi Party Time! from Data61 and Perth IT company Manufacturing Intelligence. Manufacturing Intelligence is a software company providing solutions to the mining, and oil & gas sectors via their CPU based real-time voxel representation software. They joined the hackathon to investigate using their code on GPU enabled nodes to cost-optimise their business model. The goal for their closed-source software was to gain a 20x speedup on their CPU implementation. Results far surpassed expectation – a 6x speedup of their CPU implementation and code acceleration of 30x speedup on GPU architecture. This 180x speedup success enabled them to significantly reduce the cost of running workflows on commercial cloud resources. Let’s Get Physical team led by Prof Igor Bray (Curtin University) was working on improving the performance of their quantum collision theory code. The code utilised Pawsey resources for number of years and has numerous applications, especially in the field of fusion energy, astrophysics, medical imaging and nanolithography. Prof Bray’s team participated in previous 2018 GPU Hackathon where they’ve started the optimisation process after analysing the performance of their code in details. They have continued development throughout the year which resulted in impressive speedups of 20 – 200x for selected types of ion-atom scattering simulations. During this year’s hackathon, they were able to further optimise their GPU code and additionally achieve 30x speedup for electron-atom scattering simulations. “Optimising the performance of the applications is a multi-stage process. 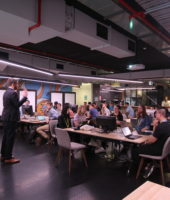 It begins with understanding the computational complexity of the code”, said Dr Maciej Cytowski, Pawsey’s Supercomputing Applications Specialist and organiser of the Perth GPU Hackathon. Oak Ridge National Laboratories coordinate GPU hackathons around the world every year. To see their full schedule, visit their Hackathon Page.